No Fenders -Formula 1, IndyCar and A Whole lot more..: Swift 66 get’s it’s Kicks! 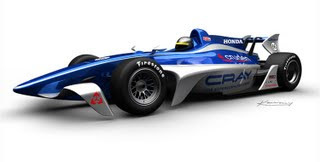 So while the scourge of talk continues over what the new 2012 Indy Car chassis should resemble... If there is indeed a new racecar brought out then? As Mr. Bernard has mentioned how he’ll now be having Gil De Ferran, the IRL Team Owners Delegate check their pulses to see if they could handle the cost of new equipment then? I have to say I’m very much taken by this latest offering from Swift... Mainly since it actually keeps the theme of an Open Wheel Racing car, a la NO FENDERS! You can read more here: Swift 66. So nice job Swift! Now just keep that gimmicky lighting system away from this car, Yuhs hear?